at the Granada Theater, 3524 Greenville Av, Dallas. 214-826-1885. 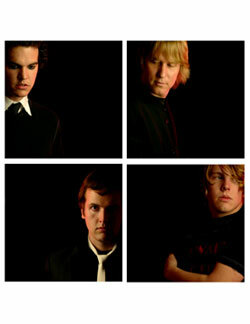 Black Tie Dynasty reaches back to the Greed Decade to create some innovative contempo-indie rock. This paean to the Bunnymen and their frontman, coming in 2005, sounds strange enough to anyone who experienced first-hand frosted spiky hair, John Hughes movies, and Men Without Hats videos. But when the person waxing enthusiastic over those 1980s-vintage purveyors of electro-orchestral introspection is 25-year-old Corey Watson, the effect is downright disorienting. Watson, singer and guitarist for Fort Worth�s Black Tie Dynasty, was all of three years old when the Bunnymen began to make their stateside impact, but he admits he�s been filling in the gaps of his Greed Decade education lately. He�s doing it mostly in reaction to major press that his band has been receiving lately from all over the world, much of it talking about how Black Tie Dynasty resembles the Bunnymen and other similar groups. With Black Tie�s big, extraterrestrial synthesizer sound, courtesy of keyboardist Brian McQuorcodale, and Watson�s emphatic, Euro-heartthrob vocals (somewhere between McCulloch�s and Simon LeBon�s), fans and journalists are throwing all kinds of �80s parallels Black Tie�s way. The Fort Worthians, obviously, want to know what the hell everyone�s talking about. Watson and McQuorcodale should be prepared to handle all kinds of questions about their influences, because they seem to have reached an early career tipping point. In addition to performing at a recent well-attended SXSW gig and recently completing tours of the West Coast and Midwest with their mentors, the Denton-based [daryl], Black Tie Dynasty has just released its debut on local Idol Records. The six-song EP titled This Stays Between Us was produced by Brian McDonald, Mike Lamm, and the band (rounded out by Blake McWhorter on bass and Eddie Thomas on drums). The tunes were written in a completely collaborative process: Watson pens the lyrics, and he says the harmonic spine of a song �can come out of anywhere� � Brian�s keys or the rhythmic drive of Blake and Eddie. The musicians have, in fact, a sizable bank of compositions that stretches back to their previous incarnation. Just two years ago, Black Tie Dynasty was called Moxie, whose signature sound was based on Watson and McQuorcodale�s straight-ahead indie-guitar approach. Moxie even released a full-length album. But McQuorcodale says that, since he dropped piano to learn guitar as a teen-ager � something that most male adolescents who want to play in rock bands think they have to do � he had always yearned to return what he calls the �soulful� sound of the piano. Black Tie Dynasty�s experience earlier this month in the Austin music festival is a textbook example of how corporations are trolling local scenes through the internet underground, looking for ways to enter the ground floor of a young band�s nascent success. Apple Computers approached the group to do a tie-in promotional for its iPod product. That promotion came in the form of 200 plastic �credit cards� with the band�s name and image as well as a PIN number so potential fans could download �Crime Scene� (the first tune off This Stays Between Us) from iTunes, the company�s e-music store. The iPod promotion and SXSW have netted Black Tie the phone numbers of a couple of major-label A&R guys � who do return calls. At the moment, though, the band is intently focused on its next few baby steps, preparing to record and release its first full-length later this year, also on Idol Records.